Peanut Butter and Chocolate….is There Anything Better? Earlier, I had mentioned that I love to bake. 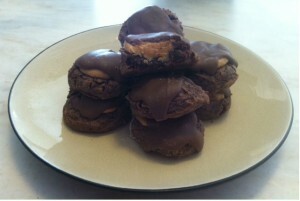 This weekends adventure in the kitchen had me trying out Buckeye Brownie Cookies. This is not my own recipe. I got it from www.tastesoflizzyt.com and had been drooling over it for two weeks before finally deciding I would just make it to get the craving out of my system. The recipe states that it makes 24 cookies, but I managed to squeeze out 36, mainly so I wouldn’t feel so guilty indulging in one…or two, and because in my mind, smaller cookies means less miles on the treadmill later. I would probably give this recipe 3.5 stars out of 5. They are very good, and you do get the best of the chocolate/peanut butter world. If you love this combination, then I would definitely give them a try. They are fairly easy to make too. The hardest part is waiting for them to come out of the oven without eating spoonfuls of the batter! Bake for the cookie dough 12 minutes, keeping an eye out to make sure the cookies doesn’t over cook or undercook. Melt the 4 blocks of chocolate in a microwavable bowl for 45 seconds. Stir the chocolate and melt for additional 15 seconds or until the chocolate is completely melted. (Candiquik comes in 16 ounce packages. When you open it, there are 16 blocks. Cut off 4 of these blocks for this recipe.) Spoon about ½ a tablespoon of melted chocolate on top of each cookie so it covers the peanut butter ball. Let the chocolate set. Store in an airtight container. Great of you to share your story. You’re awesome.